Infinidat » Infinidat is Ready for OpenStack Summit Boston! Infinidat is Ready for OpenStack Summit Boston! INFINIDAT has been a regular participant at OpenStack Summit conferences and continues to believe that storage is a critical component of the OpenStack Mission to “produce a ubiquitous Open Source Cloud Computing platform that is easy to use, simple to implement, interoperable between deployments, works well at all scales, and meets the needs of users and operators of both public and private clouds.” So we’re pleased to step up our engagement by sponsoring OpenStack Summit for the first time in the U.S. on May 8-11. We’re even more excited because the Summit is close to our new Americas headquarters and executive briefing center in Waltham, Massachusetts. Some of our flagship clients are running OpenStack native workloads with our systems to deliver unprecedented reliability, efficiency, and economics; others use OpenStack Cinder as a common abstraction layer to leverage our storage within other platforms like Dell EMC ViPR Controller and Stratoscale Symphony. Regardless of the use case, certification and integrations like our Red Hat OpenStack Platform support are important for our clients who depend on our solutions to support mission-critical OpenStack environments. 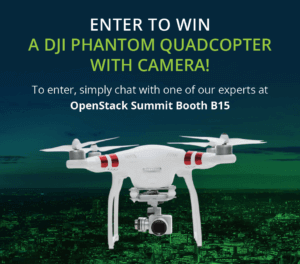 Unfortunately, our CEO Moshe Yanai’s helicopters aren’t available during Summit week, but anyone who stops by our booth B15 will get a raffle ticket to win the next best thing: a DJI Phantom quadcopter. Also, to share use cases and best practices, we’re hosting many of our current and future OpenStack clients for an exclusive private dinner during the Summit on Wednesday, May 10. We may be able to squeeze in a couple more attendees for dinner, so if you’re interested in joining us, and you recognize the challenges of scaling OpenStack storage, please contact your INFINIDAT representative or complete this quick form to make plans to meet at the show. Our storage solutions are tailor-made to address the challenges of data at scale, and with the continued growth of OpenStack workloads, we’re excited to expand our footprint in the OpenStack world. If you’re curious about how we can help you scale your OpenStack storage environments, please read our OpenStack white paper and talk to your INFINIDAT representative. If you’re coming to the Summit in Boston, we hope to see you at our booth B15 – and maybe at dinner too!